This article is for documenting the on-foot game play of Shogo: Mobile Armour Division. A simple Melee weapon that the player carries throughout the on-foot missions. Simple slash attack. "The A74 handgun is known for reliability and simplicity. The Kawamori 10mm AP round is product improved for increased feed reliability and provides adequate penetration against soft-armored targets." The Kawamori A74 "pistol" is another weapon the player has at the beginning of all on-foot missions. The two pistols fire alternately spraying the area bullets, but still providing decent accuracy. "Fires an improved 12-gauge cartridge to provide high hit probability at relatively short ranges. It was originally developed for situations in which a small group must defend against a much larger assault force." The Vollmer GA-14 CAW "shotgun" is an accurate weapon that fires a powerful blast at close range. "Fires from an open bolt, allowing it to dissipate heat efficiently at the expense of accuracy. High saturation and rugged, lightweight design compensate this shortcoming." The Skalla Arms M25 "machine gun" is a weapon that fires a spray of bullets at a high velocity. "A simple, compact, lightweight assault weapon that, because of its bullpup design, doesn't compromise accuracy. It also provides infantry with the heavy firepower of a multipurpose grenade launcher. The AT-S4 uses a 4.73 AP alloy-core cartridge that offers good penetration, high explosive dual purpose (HEDP) implosion grenades, and timed "Wump" K12 flash grenades. " The Aegis AT-24 "assault rifle" is a high speed automatic weapon that like the machine gun fires a fury of bullets. Press the weapons select button for a short burst sniper mode. A grenade launcher that blasts a blue energy ball that detonates on contact with opponents or walls also providing a large amount of splash damage. It was originally intended to be the alternate firing mode for the assault rifle. Similar to the Energy Grenade, it fires a yellow ball of Kato that bounces of walls for a little before finally detonating. This gun also provides a large amount of splash damage. A TOW rocket launcher that fires a missile that is extremely powerful with lots of splash damage. 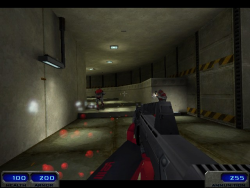 Take note that it takes a little while for the player to reload the gun. A plastic cat toy that squeaks when the player presses the fire key. Oddly enough opponents scream when the player squeaks it near them, although no real damage is evident. "Due to the hostile environments on Cronus, First Aid Kits are hard to come by, but they can be found in most areas. Use 'em to patch yourself up and keep going." A collectible item that restores player health in the shape of a long box with a cross on it. "A pilot's best friend when venturing outside the MCA cockpit. Body armor will take some of the brunt from enemy fire." A collectible item that restores the player's armor in the form of a chest plate. This page was last edited on 12 January 2016, at 22:05.